/ How is Gluten-Free Pizza Made? How is Gluten-Free Pizza Made? If you have recently converted to a gluten-free diet, you may be a little bit intimidated by the prospect of overhauling your recipe book and replacing all of your favorite homemade dishes with gluten-free alternatives. While it is totally understandable that you would feel overwhelmed right now, the good news is that many of the gluten-based dishes in your cookbook require only small tweaks to make them appropriate for celiacs or those who are gluten intolerant. That being said, there are a number of popular dishes that prove tricky for inexperienced home chef’s to recreate without falling back on gluten and, unfortunately, one of them just happens to be the world’s most beloved food. 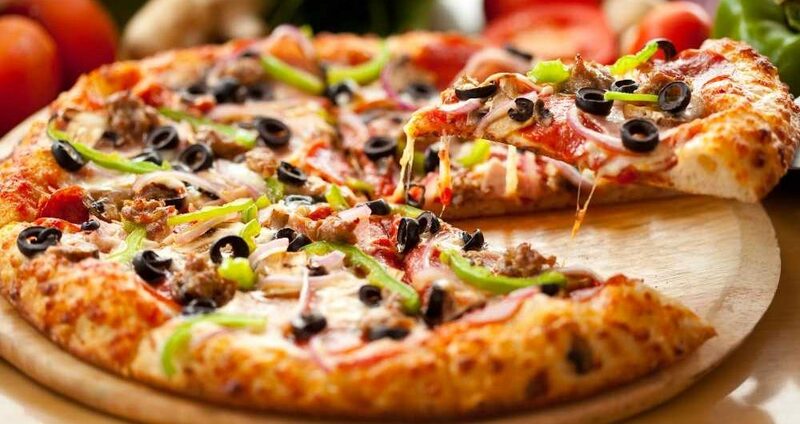 Pizza is eaten all over the world and can be purchased everywhere from five-star restaurants to tiny fast food joints with decidedly less impressive ratings. 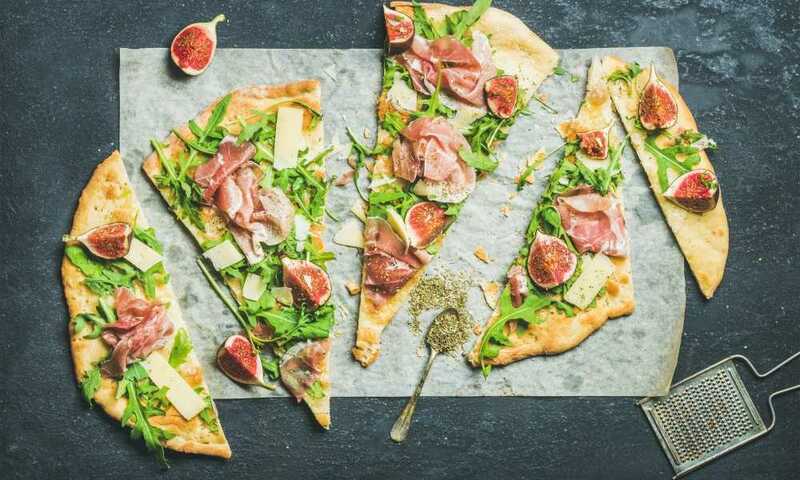 Unfortunately, the majority of restaurants that offer pizza do not offer a gluten-free alternative and the ones that do have no problem taking advantage of their customers’ dietary requirements by charging extra for it. 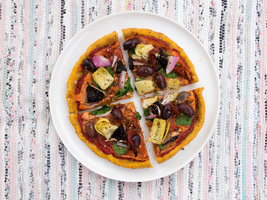 For this reason, many celiacs take to producing their own gluten-free pizza at home, which presents a whole different world of problems, the most notable of which being the fact that homemade gluten-free pizza is more than a little challenging to get right the first time. A traditional pizza almost always features a base that contains high amounts of wheat flour, which gluten free eaters must avoid. So, for a pizza to be gluten free, its base must not contain any wheat flour, which means almost completely altering the foundation of the dish. 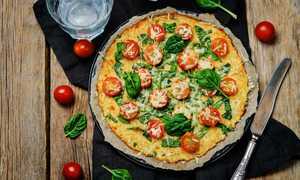 There are a number of wheat flour alternatives commonly used in preparing gluten-free pizza, each with its own unique set of benefits. 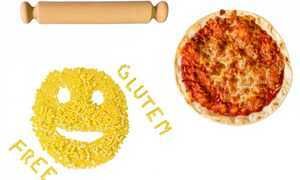 Many gluten-free pizza crust mixes feature rice flour instead of wheat flour, as do some frozen gluten-free pizzas. 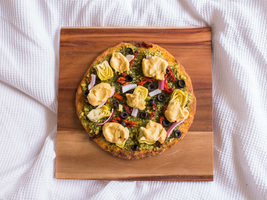 Rice flour is actually used instead of wheat flour in a lot of gluten-free recipes, but its use in gluten-free pizza is somewhat questionable as it creates a cracker-esque crust that will give the game away if you’re trying to convince your dinner guests that they are eating traditional pizza. 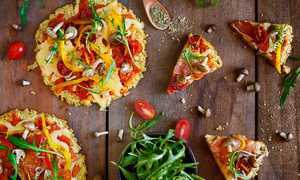 The majority of gluten-free pizzas that do not use a rice-based crust instead rely on manioc flour, which is arguably better at recreating the texture of pizza prepared with wheat flour. Some recipes actually call for a blend of both rice and manioc flour, but most pre-prepared pizza crust mixes feature only one of the two. In order to create the dough that will ultimately form the base of their pizza, most gluten-free chefs mix their wheat flour alternative with varying amounts of sugar, salt, yeast, olive oil, and water. Some choose to season their dough with garlic and onion, which certainly adds to the taste of the finished product, but isn’t absolutely necessary. Once all of these ingredients have been whisked together and spread over an appropriately sized baking sheet, the pizza base is baked, devoid of all toppings, for half an hour or so. Only after it is removed from the oven is the base ready for the collection of sauces, cheeses, and meats that will turn it into a pizza. Traditional pizza sauce is perfectly safe for consumption by celiacs and others who abide by a gluten-free diet. This is also largely the case with cheeses, but it is important to remember that certain cheeses may contain wheat-based agents to prevent sticking and clumping, which is why most manufacturers of gluten-free pizza like to play it safe by using fresh mozzarella. 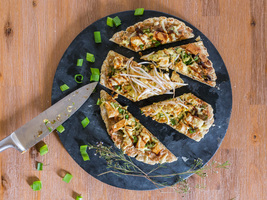 When it comes to meat and fish toppings, most can be used on a gluten-free pizza, providing, of course, they are fresh. When not purchased fresh, certain meats and fish may contain certain additives and preservatives that won’t jive with the digestive system of a celiac. 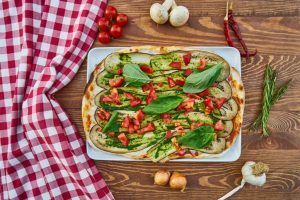 Because fresh meat is quite a bit more expensive than artificially preserved meat, some pizzerias that offer gluten-free options do so only on their margarita and vegetable pizzas in order to avoid the expense of fresh meat. 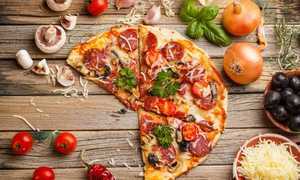 It’s generally a good idea to be skeptical of gluten-free pizza from non-franchise pizzerias anyway, as such pizzas are often prepared using the same tools used to prepare their wheat flour-based counterparts, so cross-contamination is a significant possibility. It is often said that the only way you can be certain a gluten-free pizza is gluten free is by making it yourself. 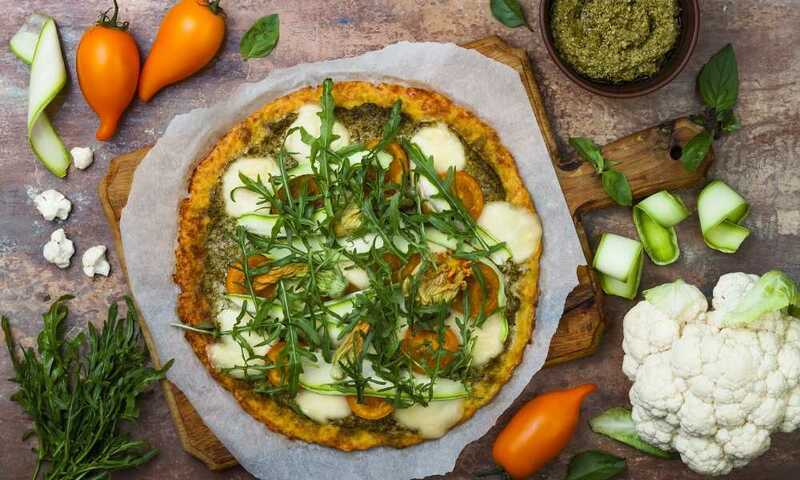 While it can be a challenge to master, homemade gluten-free pizza is certainly not out of the skill set of any gluten-free chef and, as you can see from this brief overview of pizza preparation, it comes down to a few crucial steps as opposed to a long and varied list of must-dos. 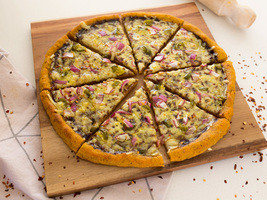 How to Make Gluten-Free Pizza Base? What is Gluten-Free Pizza Crust Made Of? 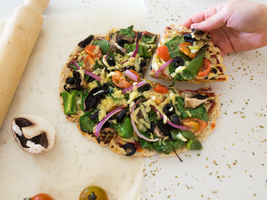 What is in Gluten-Free Pizza Crust? 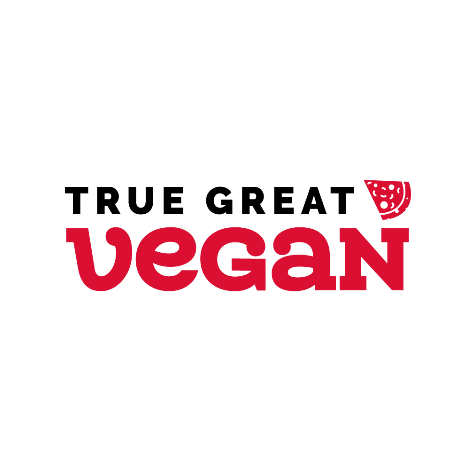 TrueGreatVegan.com is a participant in the Amazon Services LLC Associates Program, an affiliate advertising program designed to provide a means for sites to earn advertising fees by advertising and linking to Amazon.com. Amazon and the Amazon logo are trademarks of Amazon.com, Inc or its affiliates. Some recommended products may use affiliate links. This in no way affect the price you pay nor our reviews.